The site is both nature reserve and water overflow storage for excess rainwater during heavy periods of precipitation. 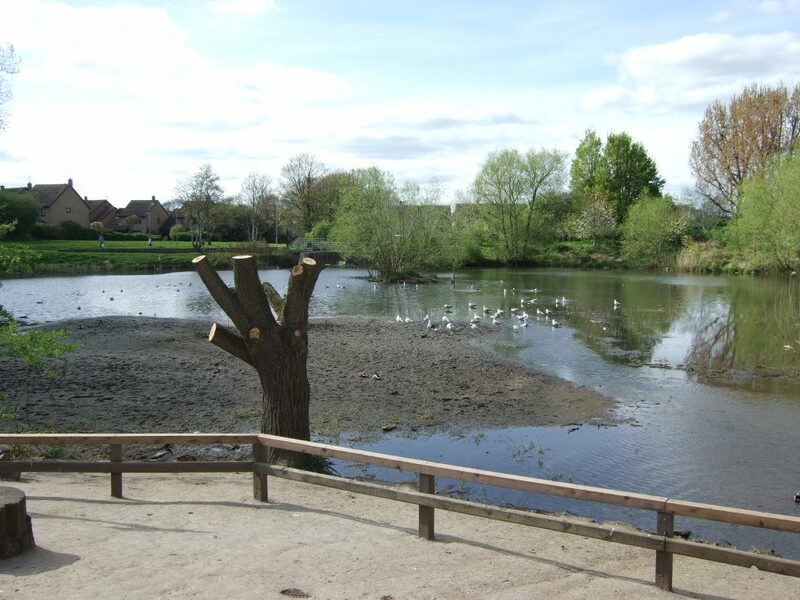 The Nature Reserve is essentially divided into two sites, the pond and its immediate surroundings, and the dry balancing pond which also contains the sports ground. When the Friends of the Pond group started in the early 1990’s, work was more hazardous due to dumped items such as bikes, trollies and/or furniture. Also we had to deal with illegal fishing and the accompanying materials. Hooks and discarded lines were both hazardous to volunteers and waterfowl. In 2007, heavy flooding occurred in the area. Prior to that date, there was small grill along with a natural river bank where the river meets the dam. It was prone to fairly high levels of flooding, with difficult access to the site. After the major flooding in 2007, work was carried out to extend a concrete platform to the dam site for vehicle access to a new flood /debris guard. More recently trees growing on the top of the dry dam were removed to stablise these important barriers against future flooding. Friends of Saintbridge Pond or F.O.S.P. have been around for over 20 years and has obtained a ‘Nature Reserve’ status. 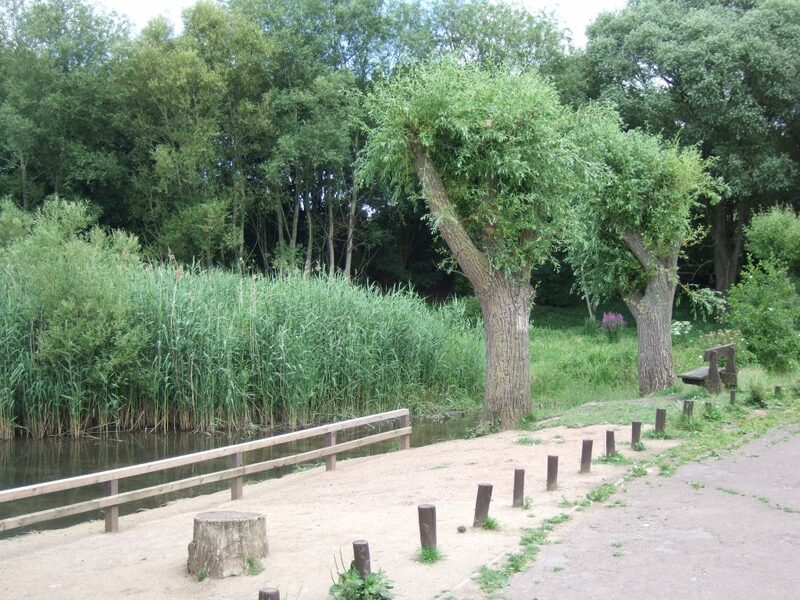 With a core group of long term & new volunteers, it has expanded its remit to include a management (development and maintenance) plans for the nature reserve as well as a model allotment, demonstrating best practice. The group has been involved with the Gloucestershire Wildlife Trust, local schools, the Environment Agency, Gloucester City Council, the Aston project police rehabilitation scheme and for the last couple of years, sponsorship from GL4 Communities. When the group was back up to speed, after suffering the loss of most of its tools and resources through arson, a new health & safety regime was initiated. A tool list was generated and this was strictly adhered to on all working days. A second application was made for the Green Flag Award and feedback received, measures around water hazards was included in the document. We have been awarded the Green Flag in August 2017 which has been renewed for the 2018/19 period after much hard work. Image taken before the upgrading of the ‘feeding area’ in 2017/18. This website has been created to communicate to the wider public about FOSP past, present and future activities so that everyone in Gloucester and visitors from elsewhere can feel as if they are a part of this wonderful space.